In previous postings, I have explained why different aspects of a suit make it more formal. Broadly speaking, a material that is smoother, darker and plainer will be more formal. A dark navy worsted is smarter in all three ways than a mid-grey checked flannel. This is an easy way to assess the propriety of a particular suit to an occasion. If your suits were to sit in the wardrobe in order of formality – from smart to sporty – it would be simple to pick the one that best suits that day’s activities. What is often forgotten, however, is that the same guidelines apply to shirts. It’s fairly obvious that a checked shirt is more casual (plainness), as is an Oxford-weave cloth (smoothness). But colour is often ignored – yet it is probably the most important of these three variables. White shirts are still more commonly worn for business in the US, because they are always and everywhere smarter than blue. In the UK, blue shirts are more accepted but then we have a tradition of sportier shirts against a background of simple ties and suits (hence Jermyn Street). This is why coloured shirts traditionally had white collars and cuffs – nothing else would show off the very smartness of being able to keep material clean, crisp and laundered. It is also why pink, despite its reputation in the US, is more formal than blue as a shirt colour. Pink is paler (usually) than blue: a lighter and a smarter colour. Even a yellow or cream shirt is smarter than blue (I was converted to the idea of a pale yellow shirt by the purchase of a Ralph Lauren Purple Label example in the sales last year). Essentially, the lighter the colour smarter it is. And cream shirts bring me on to my next point. When shirts are worn casually, they need to be taken down a formality point or two. White is too smart to go well with jeans and trainers, particularly if it has other dress shirt attributes (French cuff, lack of placket on the buttons, stiff collar, cutaway collar, lack of chest pocket). A cream or khaki shirt is the first option to consider. Let’s take an example – I often wear the jacket to a checked, woollen suit as a separate piece with jeans. The shirt to go with this ensemble needs to be casual; it cannot be white. Yet blue, to my particular taste, doesn’t suit the check of the jacket. I therefore nearly always go with a pale khaki or cream – it suits the check yet is one notch down from a formal white. It doesn’t have the high contrast of white; it doesn’t pop but recedes. So always consider the colour of your shirt choice first. If worn casually, blue is the default but khaki, cream or even grey work very well. You can follow the discussion on The formality of colours – in shirts by entering your email address in the box below. You will then receive an email every time a new comment is added. These will also contain a link to a page where you can stop the alerts, and remove all of your related data from the site. I disagree that colours are inherently ’smart’ or ‘casual’. Would you consider a solid black shirt smart or casual? I dare say the answer, if polled, would very much be divided, especially here in North America. I suspect that white is the ‘default’ colour for business attire not because it was formal, but simply because it was flexible enough to put together with every other piece in the wardrobe. Certain shades of blue are also as flexible. I am just beginning to understand layers of putting together a good wardrobe, so I appreciate the perspective about shirt color. I take your point about a black shirt, but I believe that would only apply in evening situations really. For smart day wear, I believe white is inherently smarter. And as you say, the standard pale blue is just as flexible as white, and yet white is the smarter colour. Smartness is higher contrast, which happens only with white (or black, as you point out). I’ve been working these colours you mentioned into my wardrobe for a couple of years now, especially ecru and grays (striped in various sizes). They add a vast new dimension to an existing wardrobe. I remember reading somewhere that the British in London tend to vary shirts and somber ties against very neutral suits far more than their continental counterparts. Do you notice this? The white oxford cloth button down is a common and beautiful pairing with jeans. Simple, elegant and relaxed. Add a navy shetland and flash back to “Risky Business” as Joel stands in the airport waving goodbye to his parents. I worked in London in the early 90s and was happy to adapt the city uniform while working in Lloyd’s of London. Striped shirting, Hermes ties, Hermes Lobb monks. Today I like to mix the two. Shell cordovan Alden tassels with a SB peak lapel suit or a white button down, Hermes tie and a Turnbull and Asser Blazer with hacking pockets. Each style is unique to its country. Only makes sense to mix it up in a Mischianza of style cues and see if anyone notices. Jeezz…I was thinking of “Risky Business” in that exact same scene! But the off-white button downs (see Roger Thornhill in the hospital) such as grays or ecrus are just a bit more flattering the white on jeans. Must be the dropping flesh on some of us aging folks…except if you stay really tan! Hi Simon I’ve read your posts concerning white shirts and the smartness of them. Problem is that the white collar seems to get dirty in about 5 minutes leaving a yellow stain. They then need to be cleaned extensively .. Does this not make them v impractical? 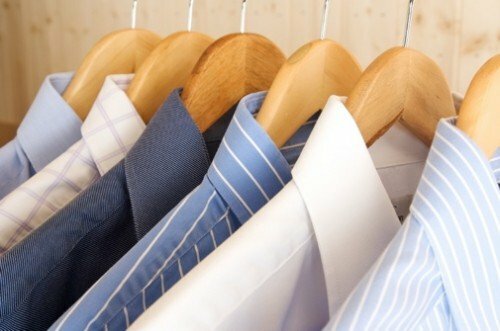 Do you have shirts dry cleaned regularly? No, never dry clean, wears the shirts out. A good wash with some Vanish or similar stain remover should be fine. Put it on the stain and do it regularly.